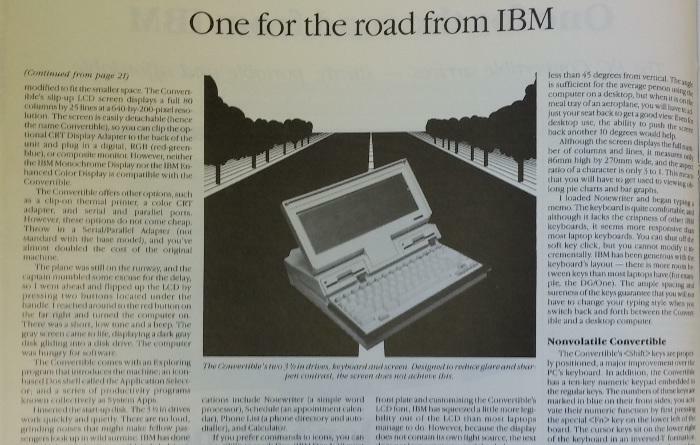 A look at ads and more from the computing heydays of the 80s. We take a nostalgic walk down memory lane with a look at advertisements and more from the computing heydays of the 80s. The following images were featured in Australian PC World issues dated between 1986-1987 and they tell stories of a time when IBM was the big-dog, floppy disks were the preferred method of storage, and the colour monitor was being born. Some of these will make you feel old and others will cause you to laugh, but a rare few will make you well-up with joy. 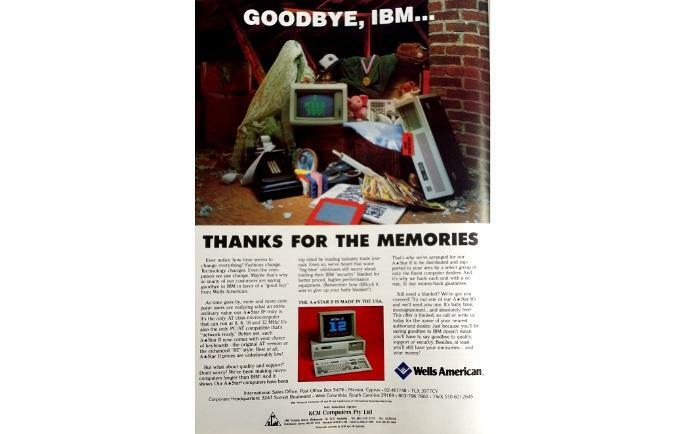 Wells American, a brand presumably unknown to generation Y, made a bold move in 1987 by placing an advertisement that depicted IBM computers as rubbish. 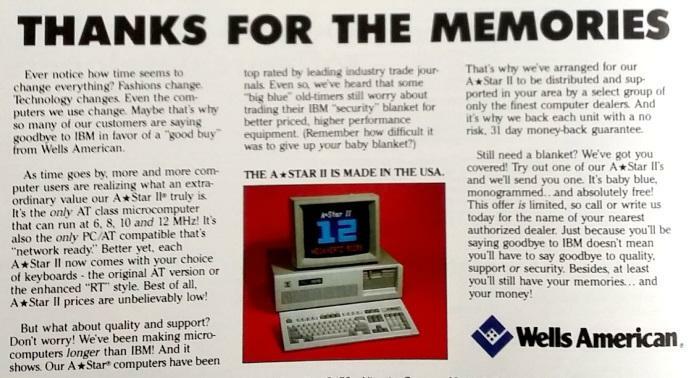 Wells American assured potential customers its computers were top quality by claiming it has “been making computers longer than IBM”. The benefit of 20-20 vision reveals it was a case of a smaller company trying to punch above its weight as, unfortunately, the company declared bankruptcy the very next year. 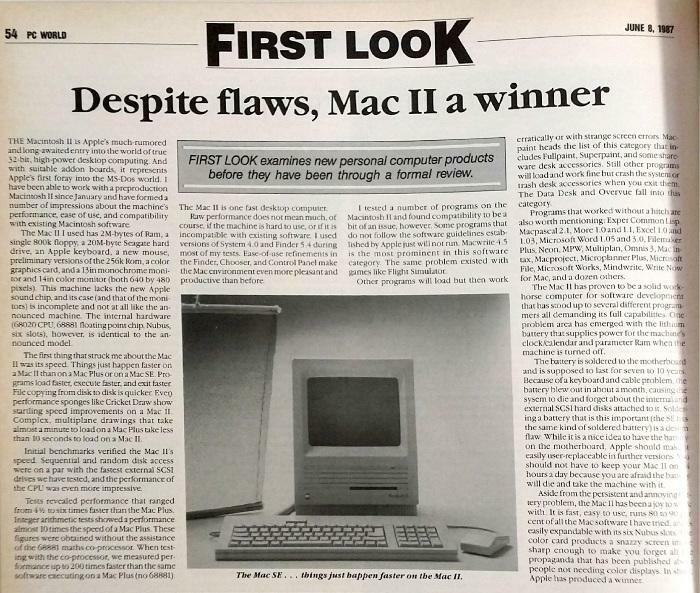 Transcript of the reviewer's concluding paragraph: Aside from the persistent and annoying battery problem, the Mac II has been a joy to work with. It is fast, easy to use, runs 80 – 90 per cent of all the Mac software I have tried, and is easily expandable with its six Nubus slots. The color card products a snazzy screen image sharp enough to make you forget all the propaganda that has been published about people not needing color displays. In short, Apple has produced a winner. IBM was in Apple's cross-hairs even more so than Wells', especially in the famous Super Bowl ad alluding to Orwell's 1984. In this first look, see if you can spot any kind of resemblance between the current generation iMac and its ancestor. It's like trying to find Wally in Shakespeare’s Hamlet. Where did the tapered 5mm edges of the new iMac come from? And what of the black bezel? Seagate disk drives larger than five inches had a storage capacity of up to 80 megabytes (MB) in the golden days of the 80s. The technology proved popular, with Seagate claiming that “more than 4 million” of its 5.25in hard drives had been bought by “quality-conscious customers”. Consider that today you can carry approximately 800 times more storage capacity on a microSD card that's the size of your fingernail, and you can really see how far the storage game has progressed. 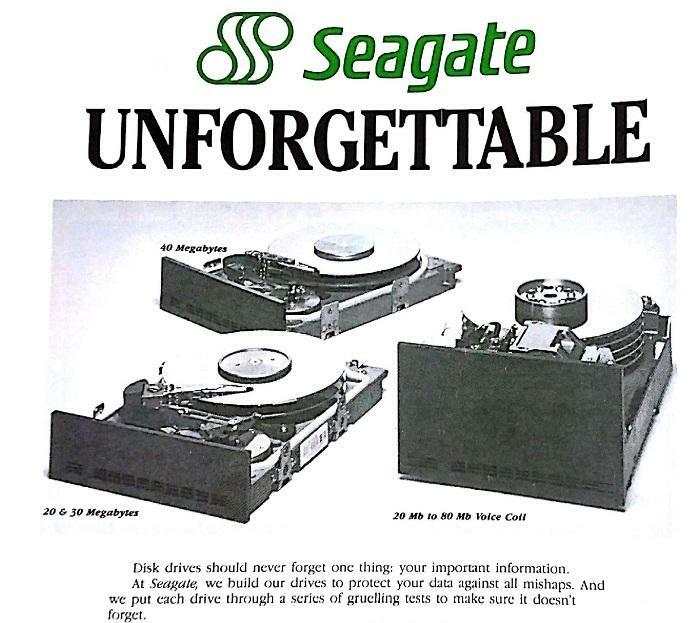 The boffins behind Seagate’s marketing department in the days of this advertisement do deserve kudos for cleverly titling the ad “unforgettable”. Transcript: The NEC Powermate is fully industry compatible. It has 640Kb of memory as standard, expandable to 8.6Mb. An 80286 processor. A colour monitor with a resolution of 800x560 pixels. A 20Mb hard disc and a 1.2Mb floppy disc. A new 101-key keyboard. Serial and parallel interface. And a recommended retail price of $5,426, excluding tax, for model P-Mate-4C. No other desktop offers so much for the price. In short, the Powermate sets a new standard in desktop computers. Gracing the opening pages of the March 1987 issue of PC World is this ironic advertisement from now-service-and-solutions company, NEC. 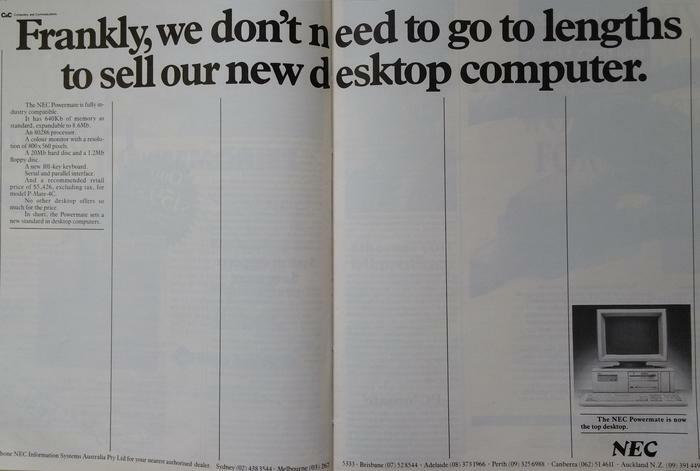 The advert spans two pages, but NEC leaves most of the space blank claiming “we don’t need to go to lengths to sell our new desktop”. The desktop in question was the Powermate, a desktop computer that features — brace yourself — a 101-key keyboard and a 1.2MB floppy disk tray. A computer like this would set you back a sweet $5,426, and that excluded tax. Transcript of the reviewer's concluding paragraph: Every laptop has its compromises and its innovations. Laptops containing hard disks and electroluminescent displays are now coming on the market, but always at the expense of battery life and budget. IBM has clearly chosen a slimmed-down, less-is-more approach and has designed an affordable computer built for the road. Sure we can dream of a $A4000 laptop with a readable screen and all-day batteries, but that may be a long time coming. In the meantime, the PC Convertible is a fine machine that has proved itself where it counts – on the desktop and in a 737. As I picked up my baggage, I was already thinking about how to use the machine on the trip back. What we have here is the first PC convertible from IBM, or as they were known in the 80s, ‘Big Blue’. By the day’s standards, the 5.5kg convertible was considered portable, and it came with options including a thermal printer and a colour CRT adapter. Today we can display our desktops on televisions through connections such as HDMI, but with the PC Convertible, Big Blue would remove the screen and mount a monitor, at an additional cost of course. The PC Convertible was not a cheap machine at $5964. Imagine lugging this thing to and from work on a daily basis — there would be no need for leg day. 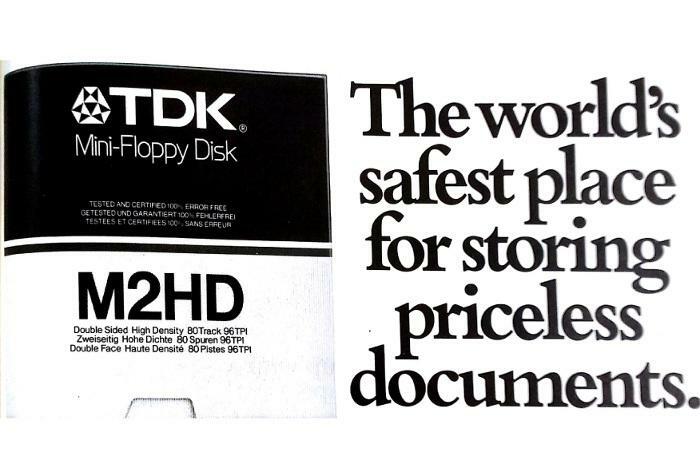 TDK, like many other companies, was rallying interest in its mini-floppy disk technology. “The world’s safest place for storing priceless documents,” the ad reads. Today’s technology is moving towards solid-state storage, but one thing that hasn’t changed is the ongoing concern of data loss. Coinciding with the rise in computing was the rise of complementary printers, and at the time Epson’s dot-matrix printers were right on the cusp of cutting edge. Although the majority of the February 1987 PC World issue was in black and white (colour was really expensive to produce back then), this full page advertisement jumped at you in glorious spot colour (and it definitely would have cost a lot). 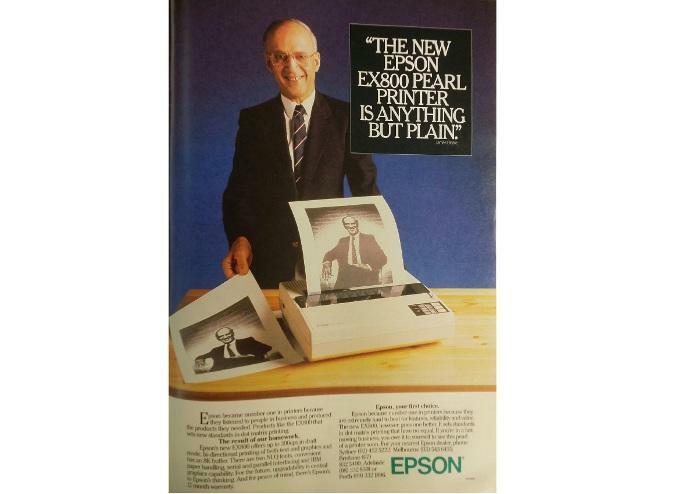 It championed the Epson EX800, which Epson claimed set “standards in dot-matrix printing that have no equal”.